The Redemptive Nature of Laundry. It has to be the suds. Or maybe the agitation. No, the dryer. Whatever it is, I like doing laundry. I like turning dirty, balled up clothes into a freshly laundered stack of clean duds. Don’t ask why because I? Don’t know. Checking the pockets yields a jackpot of surprises: forgotten money, a mint, lost keys, missing flash drive, gum, even a credit card. Sneaky little bandits, aren’t they? It’s into the wash basket for them. Shorts that sat in popsicle goo, mustard stained t-shirt, jeans with bleach spots, socks with a hole in the toe, the whole lot. Front loading washers are the best, I watch the clothes through the window. It’s a melee in there. The clothes somersault and twist and pirouette, they push and shove and shimmy. It’s a mosh pit and a carnival ride and a grand day at the spa rolled into one. Even the lowliest sock gets the royal treatment on laundry day. The entire process is incredibly cleansing for the clothes and, okay, yes, for me. When the washer shuts off and the cylinder stops revolving, the door pops open. And there they lie, soggy, exhausted, still reeling from the spin cycle. It’s a disheartening moment. They look so, what, so pitiful. Gone is the dancing, gone is the frivolity. Never fear, the dryer is one amazing household appliance. Take clothes fresh-from-the-washer, toss them in the dryer, select your temperature, turn it on, and magic happens. Tell me, what’s in there, a valet? Seven pounds of wet, mashed rags turns into three pounds of warm, familiar friends. The transformation is nothing short of miraculous. Life and cleanliness (which is next to godliness) have been restored. Yet, we’re so accustomed to this phenomena we usually fail to notice. The dryer is a grossly under-appreciated appliance, ladies and gentlemen. Give it a pat on the head once in a while. Show it you care. Hard to believe these are the same clothes pulled from the hamper a couple hours ago. They’re fluffy, they’re bright and cheery, they’re soft. I look at them and I feel fluffier, too, brighter and cheerier. Holy cow, I’ve been redeemed through association.That’s good enough for me. Who am I? And who are they? I love doing laundry too. My favourite load is the towels when you pull them out of the dryer and they are warm and cozy and smell amazing! There’s nothing better on a cold day that a warm load of blankets and towels to curl up in. You’re preaching to the choir, writerwannabe. In the winter, I won’t put it on unless it’s been pre-heated in the dryer first. Cheers. Laundry never sounded as fun as it does through your words! I miss clothes lines. I always enjoyed watching the clothes flap in the breeze. Hearing the snap of the towel on very windy days. Thank you, Lenore, what a great compliment. 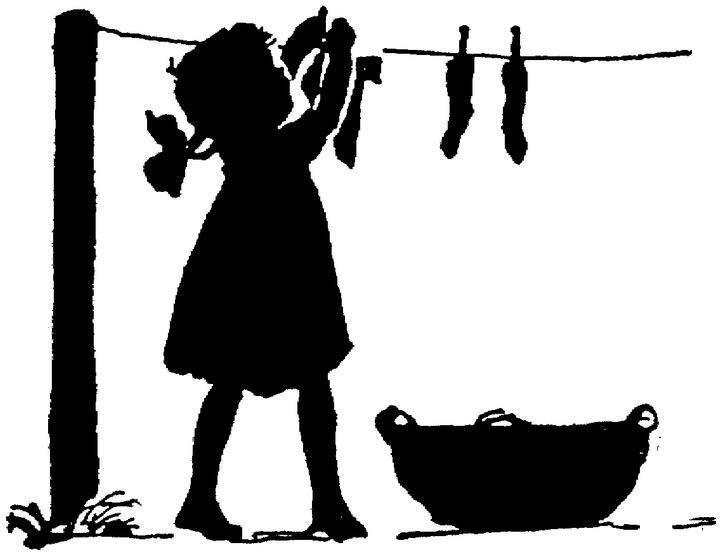 You know, I rarely see clotheslines anymore — I used to, they were all over the place back in the day. Remnants of them, the poles, mostly, can still be found around here. I wonder if smog / air pollution have something to do with their disappearance? I’m an old-fashioned girl. If the weather is not too hideous the laundry goes on the line. At this time of year, it doesn’t get properly dry – so it finishes in the dryer. But in summer? It’s the line all the way. Okay, that’s two for clotheslines, two for dryers. A guy I know likes the clothesline for exfoliation purposes. Not me, I need the soft. Yes, but do you SORT the clothes first? If the clothes are well-worn and faded, I don’t. If they’re newish and likely to bleed, I sort. In the middle? I use Color Catcher from Shout. I should work in a laundry, I’d be happy there. Yesterday, I turned a just-enough-to-make-a-load of mixed whites/colored clothes pink, thinking everything was colorfast. HURR. Tried re-washing the pinkened whites again, with THREE Tide Stain Boost thingies tossed in. Still pink as hell. Had no choice but to toss everything, being highly allergic to bleach. I need you. I’m willing to pay. If you iron too, I’m willing to pay double. Be right there, poppins, hang on. Sorry, though. Get a box of Color Catchers, just to be on the safe side. They’re a sheet you drop in the washer with your clothes — it absorbs the colors that leak. I do iron, but I’m slow. When it comes to laundry and such I’m a bit of a compulsive. And for you? No charge. Here I come. The dryer was the only part of doing my laundry that I actually LIKED. I completely understand what you mean :) Its a wonderful feeling to see those warm, nice-smellling, soft (if you’ve used a softener sheet) clothes stare at you when you open the dryer! Boy, I don’t know, it sounds good the way you describe it, but I still think I hate doing laundry. My wife is always saying she worked hard today, she did the laundry. I tell her the machines did the laundry, all you did was fold and put away the clothes. We have ultra new appliances which cost a mere fortune and they do everything but that, including a steam press feature. Boy, I worked hard doing that laundry. You’re right, O. Leonard, doing laundry is mostly waiting. I don’t mind waiting, especially when the payoff is so good. How can you not like doing laundry?